While searching aimlessly on Pinterest one evening I found a few pictures of chocolate covered bananas (like this one from Little B Cooks) and knew that my entire family would devour them. My dear sweet husband recently found something similar in the freezer section of the grocery store but I hate buying things that are processed and pre-made. I decided to tweak the recipe just slightly and add our own flare to it. I hope you enjoy them as much as we did. Banana bites covered in chocolate-nutella and sprinkled with toffee chips before frozen. A little bit healthy and a little bit heavenly. Peel and slice bananas into 1-2" wide pieces. In a small glass bowl melt chocolate morsels and Nutella (microwave or stove top). Stir mixture until smooth and well blended. 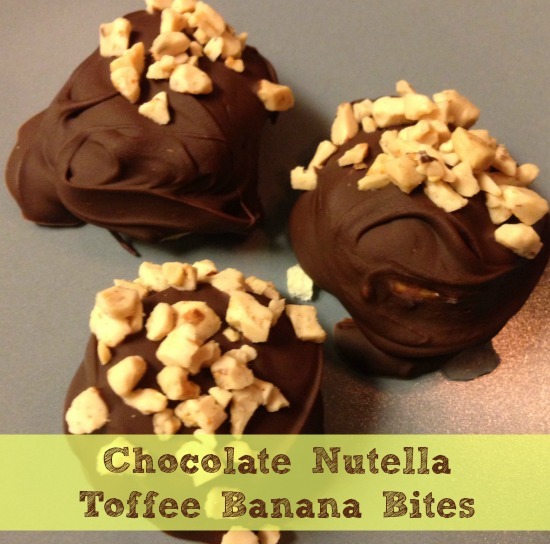 Place banana slices on a lined cookie sheet and spoon on a tablespoon (aprox) of chocolate mixture over the bananas. Wait until the kids go to bed and then enjoy your snacks and whatever you do - don't share! OK, I did end up sharing these with the family and I think they approved because there wasn’t anything left after our little after dinner snack. You could really top them with anything. I think next time I’ll mix chocolate with peanut butter and sprinkle with chopped peanuts. What would you top them with? 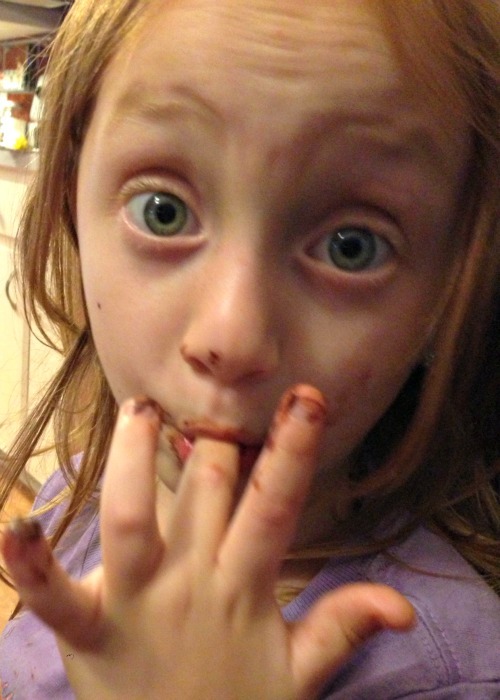 BEWARE: They do melt in your hands and your children may look like this after eating them. I don’t think she minds though. Enjoy! I bet my husband would love these!